A steady string of arts venues have suffered closure in the UK in recent weeks. The Komedia in Brighton has had to shut its doors; the Windsor Arts Centre closed its doors last friday; and earlier this month the Lemon Tree in Aberdeen suddenly shut its doors as well. I should note in the interest of full disclosure that my wife had been in charge of marketing at the Lemon Tree for nearly a year, and its sudden closure came as quite a shock. It was hardly the season’s greetings we were expecting from the Aberdeen City Council. The Lemon Tree closing was particularly disappointing for us, as it was a great venue which did a lot of community and charity work; and in many cases funding was secured which actually made these events profitable. Sadly the trend seems likely to continue. And what is the root cause? Arts funding is always a battle, especially for real new and creative enterprises. In many cases much of the money the arts council and other organizations had previously given these organizations has been diverted to the Olympic fund. Not only that but corporate and other sponsorships are diverted to the Olympics as well. It’s not only arts funding either. 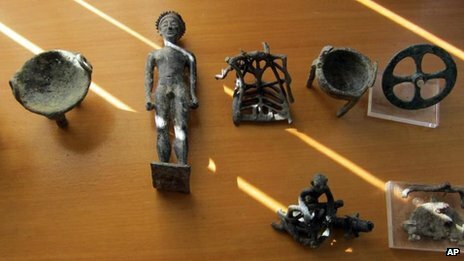 The Portable Antiquities Scheme, a pioneering community archeology project will likely have its funding cut this year. Will Anderson rightly points out that “to halt the PAS now that it is operating so successfully would be folly. All so they can build another few domes for the Olympics. It is the department of ‘Culture’ Media and SPORT and its proxy the Museums, Libraries and Archives Council, that deserve to be scrapped”. Colin Renfrew had an excellent summary of the scheme’s benefits in an opinion piece in the Guardian earlier this week. He points out that the scheme is “starting to transform our understanding of many aspects of the past”. Seventeen PhDs have used PAS data. I know it featured prominently in my thesis as an excellent and pragmatic way to effectively regulate sites in source nations. In terms of concrete discoveries, a Viking age cemetery was discovered in cumbria, a Roman bowl bearing the names of forts on Hadrian’s wall has been acquired by the British Museum and others. Perhaps most importantly, “the scheme has also taken the initiative in policing the internet for objects that should be reported under the Treasure Act and has promoted a code of practice”. The situation isn’t any better in Scotland either, where funding for the 2014 Commonwealth Games in Glasgow will likely begin to increase as well. I don’t doubt that holding the Olympics in London will give a number of benefits to London and the UK. Perhaps if most British citizens were given a choice maybe they would choose Olympic funding over the arts and culture. However, I think those in charge should be upfront about the hidden costs and very real cuts which this Olympic bid will cause.